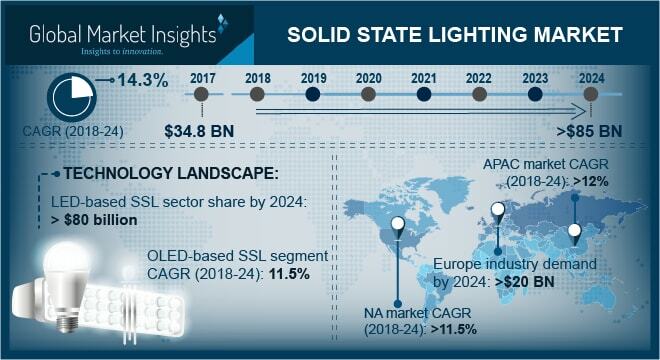 Solid State Lighting Market size is set to surpass USD 85 billion by 2024; according to a new research report by Global Market Insights, Inc. Rapid urbanization & industrialization primarily in Malaysia, and China have increased the focus on energy-efficient lighting to reduce GHG emissions and improve bulbs life may contribute to solid state lighting market demand. These products provide high energy efficiency and less heat generation as compared to incandescent lamps thereby leading to reduction in carbon emissions. The implementation of solid state lighting technology may reduce global lighting CO2 emissions by approximately 1,500 million tons thereby stimulating market growth. High efficiency, improved battery life, and design flexibility are contributing to rising solid state lighting usage in automotive lighting applications. Additionally, increasing usage of solid state lighting technology in high, mid and low-end cars pertaining to cost standardization and optimization may further propel solid state lighting market. Rising high-brightness LEDs demand for providing high visibility & differentiation is likely to boost the market. Ban on energy-inefficient lighting products such as incandescent and halogen bulbs majorly in the U.S., Germany, France and UK is likely to significantly boost solid state lighting market growth. For instance, EU ban on incandescent, halogen bulbs & CFL lamps is further promoting the usage of LED bulbs in the region. Regulations against incandescent bulb import, manufacture or sale for general illumination applications is estimated to significantly expand the market size up to 2024. Europe OLED based solid state lighting market size may register gains close to 11% by 2024. Declining prices due to reduction in manufacturing costs and increasing demand for sustainable & energy-efficient lighting products are predicted to boost market growth. solid state lighting products are majorly used in several outdoor lighting applications such as parking lots, campuses and street lights which may further contribute to the growth solid state lighting market demand. Phosphides & nitrides of aluminum, gallium and indium are the major raw materials used in manufacturing of solid state lighting products. High manufacturing cost owing to expensive raw materials and low emission efficiency will be a major challenge and may pose a high threat for the solid state lighting industry growth. U.S. LED market size from outdoor applications may witness significant gains at about 12.5% by 2024 owing to declining streetlight LED prices and rising government focus on energy efficient products. The progress of LED outdoor lighting market from a nascent to a mature stage along with replacement of decorative streetlights in various cities such as Las Vegas, Los Angeles and New York to achieve energy & cost reduction will further stimulate market growth. General Electric, OSRAM, Koninklijke Philips, and Cireon are the prominent industry participants in the solid state lighting market. Companies are concentrating on innovative strategies to improve color rendition and achieve cost advantages in addition to indulging in acquisitions & collaborations to complement their product portfolio which may stimulate solid state lighting industry demand.